The fact is, that police killing or brutalizing people of color does happen here and has a long history of happening here. 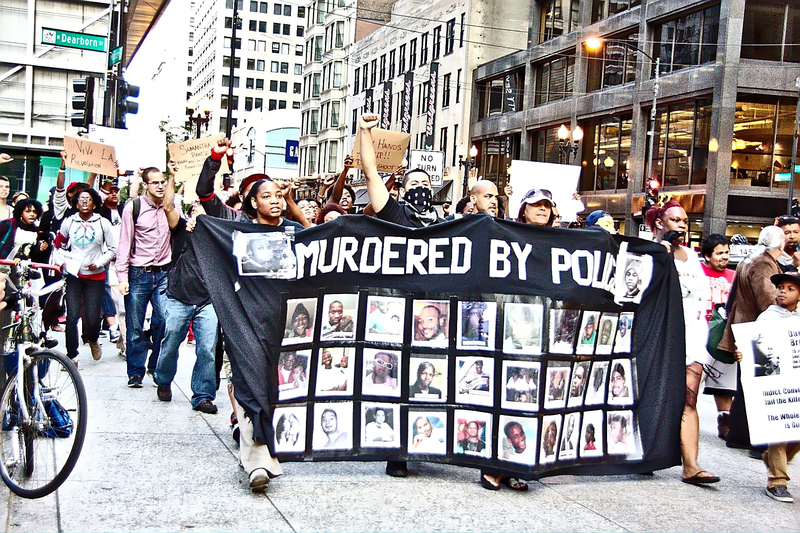 Whether it was the brutalization of Indigenous people by White colonizers, the decades of Black people being the target of police brutality, or the harassment of other communities of color, what is happening in Ferguson is a microcosm of what has taken place in Grand Rapids and all across the country since the beginning of European colonization of this hemisphere. It is not only important that we come to terms with this history, but do the work of learning from it. One way to learn from history is to examine specific incidents, which not only tells us a great deal about what has happened, but how oppressed communities responded to the violence and how systems of power and oppression responded. It is particularly important for those of us who benefit from systems of oppression, those of us with privilege, understand these dynamics if we are going to play any serious role in challenging and dismantling these systems of oppression, which in this case is the system of White Supremacy. 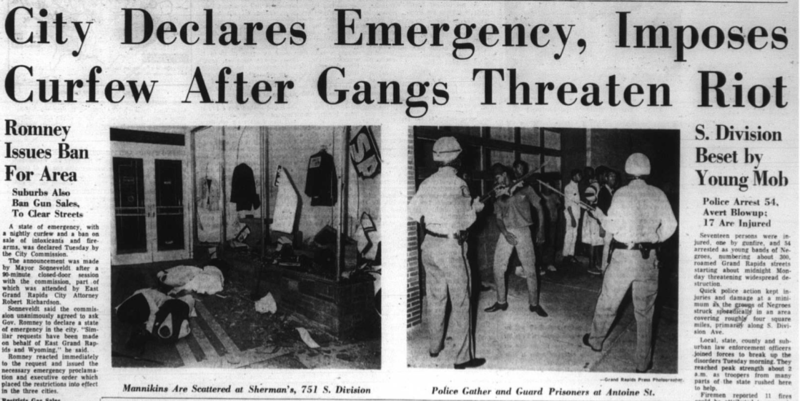 The race riot, or as some refer to it as, the racial uprising that took place in Grand Rapids, in July of 1967, is a useful example to learn from. Like all across the country, the Black community in Grand Rapids suffered from high levels of poverty, unemployment, limited educational opportunities, poor housing and little political power. On July 24th, Grand Rapids police pulled over a car with several Black youth, and in front of several witnesses, used “excessive” force against the Black youth. This was the spark that ignited an entire community’s rage over decades of institutional racism and exploitation. Some in the Black community smashed windows of White owned businesses, while others set fire to abandoned or rundown buildings owned by absentee landlords. An estimated 320 arrests were made during the three days that rioting took place, with most of the arrests involving members of the Black community. There is nothing exceptional about how the Black community responded to police brutality in Grand Rapids during those summer days in 1967. They rose up and they resisted. Much can be learned from how oppressed communities respond to systemic oppression, lessons that are well documented in Charles Cobb’s recent book, This Nonviolent Stuff’ll Get You Killed: How Guns Made the Civil Rights Movement Possible. However, it is equally important for our purpose to learn from how the systems of oppression and those in power responded. The local media, typified by the first editorial from the Grand Rapids Press, used harsh words to condemn those who participated in the uprising. At the first meeting of the Grand Rapids City Commission, the political body that ruled the city, passed a resolution, which praised the police department and any business or individual that “cooperated” with the cops. An interesting assessment, especially since the police initiated the violence and turned the southeast part of the city into a militarized zone that they controlled. In addition to the racist comments from surrounding communities, several White Grand Rapidians contacted the GRPD to volunteer to assist in putting down the uprising and several White residents were arrested near the area of the riot because they had concealed weapons. Lastly, those in power commissioned a study that was issued months later, entitled, Anatomy of a Riot. The report not only documents what took place from the perspective of those in power, it offers “solutions” to prevent future uprisings from taking place. On page 34 of the report, there is a list of problems that need to be addressed. Everyone of these problems that are listed focus on behavior or are framed in such a way as to ignore any systemic forms of racism and White Supremacy. In other words, the report was just another attempt to offer just enough of a reformist response without ever having to challenge or dismantle the system of White Supremacy. All of these responses are important if we are to understand how entrenched the system of White Supremacy really is. However, it is the last point we need to pay extra attention to today. We can not afford to see the police brutality in Ferguson as bad behavior by a few bad cops. We have to see it for what it is, a manifestation of White Supremacy. More importantly, we can not be seduced by the notion that we just need more programs for Black youth or more social services in order to prevent more people of color from being murdered by the police. We need to dismantle White Supremacy. Granted, dismantling White Supremacy is not a single act or an easy problem to overcome, but anything we do that does not have that goal in mind will only result in this kind of violence being played out over and over again. Again, this is especially important for those of us with multipole privileges, especially White Privilege. We can not engage in activity that just makes us feel better and we cannot do things that will “help” people of color. We must struggle against and ultimately dismantle the system of White Supremacy. If we don’t, then we are complicit in the systematic oppression of communities of color. This entry was posted in Civil Rights/Freedom Movement and tagged 1967 race riot in Grand Rapids, lessons from ferguson, system of white supremacy. Bookmark the permalink.